Nuvollo has developed Performance based cloud/hosted solutions with the “RIGHT” end-user experience, leveraging unique understanding of the networks, IT infrastructure and your Business Critical Applications. Microsoft offers a variety of different ERP options to perfectly meet your company’s objectives to effectively and efficiently manage the business. 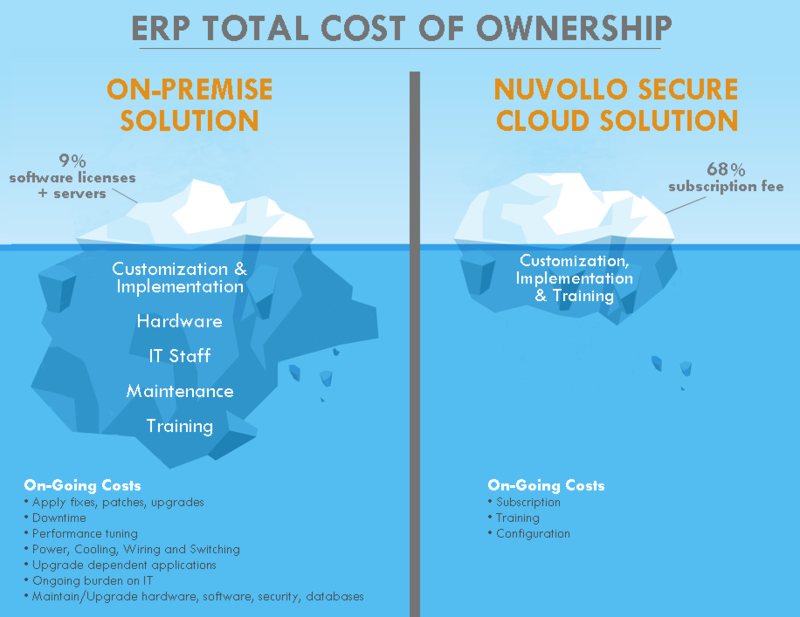 Microsoft leadership combined with the Nuvollo Smart Cloud the Dynamics suite of ERP solutions provide the flexibility and collaboration capabilities generally lacking in an on-prem environment, without the large capital expense required up front. Nuvollo has partnered with Microsoft to provide hosted best-in-breed ERP applications such as GP, NAV & AX. Rather than buying client access licenses and servers, customers pay a subscription fee for the complete ERP hosting service. Until recently, feature rich CRM applications, such as Microsoft Dynamics, were only available to large corporations with deep pockets and the ability to outlay large amounts of capital. Nuvollo’s hosted Dynamics CRM offers the complete features available in an on-prem application with no capital expenditures and a low monthly fee. Furthermore Nuvollo has perfected a model so that your monthly costs are less than the cost of the perpetual license and takes your all of your management headaches away while ensuring you are at the rev level you want and need. Let us show you how to optimize your CRM expenditures so that you can concentrate on your core business. Therefore Nuvollo has partnered with Microsoft to provide hosted best-in-breed applications such as Dynamics CRM. Rather than buying client access licenses and servers, customers pay a subscription fee for the complete CRM hosting service. We understand that business processes are complicated and not all aspects of business are right for a single cloud solution. Therefore in addition to our S6 (six levels of security) for all of our services, we have created multi-level hosting solutions, such as our Cloud o’ Premtm (CoP) solution which provides the most secure virtualization available by recreating your individual environment in the cloud. Thereby gaining all the benefits of the cloud while maintaining the control and security of your on premise environment. Email has been a mission critical application for years, and O365 delivers email with best practices, across multiple database availability groups, and we can select datacentres in Canada, the US or elsewhere in the world depending on your location. Migration to an Office 365 Exchange platform is a great way to get a worry-free emailing platform, with virtually unlimited storage capacity included. Nuvollo can also help with your cloud migration if you wish to leverage OneDrive for Business, SharePoint or many other O365 applications. We help ensure a smooth migration to O365 and offer the ongoing support as needed to make changes and leverage the cloud efficiently.